Acolytes light the candles, assist with the offering and Communion and other things during our worship service. Our nursery is open to infants through preschool age children. The nursery opens at 10:50 during the school year and 9:50 during summer worship hours. If your child is preschool age, please bring him/her to the sanctuary to begin church with all of the Sunday school aged children. After the Children's message, they will be released to their Sunday School/nursery classes. Our Sunday school classes are divided into Grades K-3 and grades 4-6. Children begin in the sanctuary with their families and then will be dismissed to Sunday school classes after the children's message. If you are interested in volunteering to teach or assist teaching Sunday school, please contact Sarah deKramer at gdekramer@aol.com. We can always use an extra set of helping hands and appreciate our volunteers very much! Liturgical dance is a creative way to worship God through very simple dance movements. For children in grades 4 -12. Rehearsals at the church. NO DANCE EXPERIENCE IS NECESSARY! Contact Anya Eleftherion at ﻿anyal_grant@gmail.com for more information. 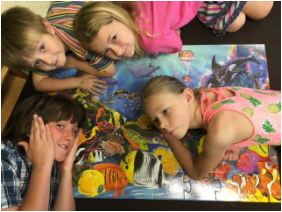 VBS is a morning summer camp usually held one week in July for preschoolers through 6th grade. Children get to experience God's love through Bible stories, games, crafts, and music. The camp is run by parent and church volunteers along with our teenage camp counselors. We are very proud of the large number of teenage volunteers that continue the VBS experience as counselors and make the VBS experience so much fun for the younger kids. Christmas VBS is a one morning event for preschoolers through 4th grade that usually occurs the first Saturday in December in conjunction with Epiphany's Christmas Bazaar. Children experience the birth of our Savior through the Nativity story, games, crafts and music. The camp is planned and executed by our Youth Group (along with parent volunteers) as a fundraiser for Youth Group events throughout the year. It is a wonderful opportunity for parents to begin their Christmas shopping, wrapping and baking while we share the joy of the Christmas season with the children. The children and youth of Epiphany celebrate the good news of Christmas by performing a Christmas Musical during our Christmas Eve service. Children learn music, rehearse their script and wear costumes to help tell the important story of our Savior's birth. We have one of the best preschool programs around! New classes are created as needed. To learn more, go to epiphanypreschool.com or call (703) 938-2391.